Halibut is a firm-fleshed, mild-flavored, meaty white fish that can be prepared in many ways. It is sold as either fillets or steaks, with or without the skin (which is edible). The tender flesh has a somewhat sweet taste and therefore doesn't need much seasoning. 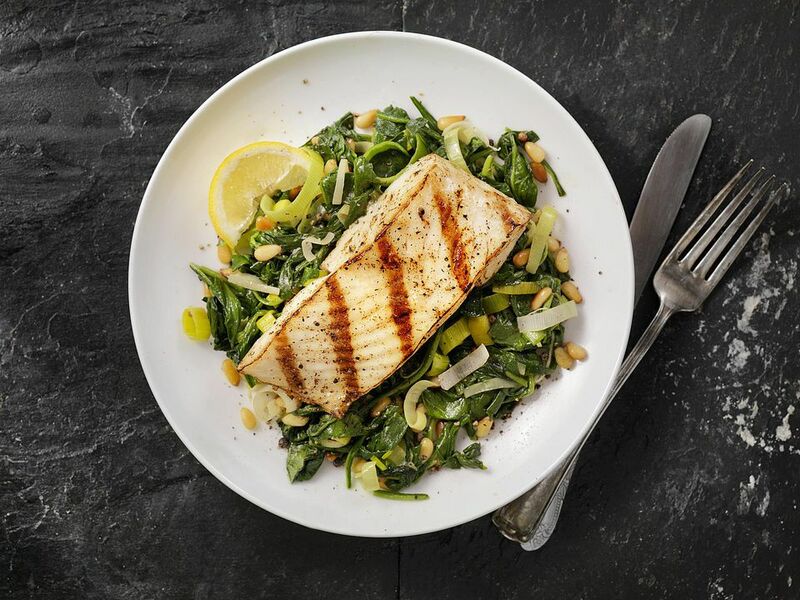 Halibut is low in fat and rich in omega-3 fatty acids, making it a healthy choice when looking for a lighter meal. But because of this very low-fat content, it can dry out easily, so cooking methods that use a liquid such as poaching tend to be the best. If careful, though, you can grill a halibut steak or fillet to perfection. Halibut can get up to 500 pounds but is typically harvested at about 50 to 100 pounds. The smaller the halibut, the better the fish will be. Chicken halibut is the smallest at about 10 pounds and is the best kind to buy—and the most expensive. When selecting fresh halibut, choose fish with a fresh odor (doesn't smell fishy), firm meat, and a moist appearance. If you buy frozen raw halibut, it must be frozen solid; if you can dent it, don't buy it. Keep in mind that frozen halibut has less moisture than fresh, so it will dry out more quickly. Halibut steaks are easier to grill than fillets, but you can select either—just make sure to follow a few tips if you purchase the fillets. The biggest trick to grilling halibut right is to make sure you oil your cooking grate before you start to prevent the fish from sticking. Once the fish starts to stick, you will have a lot of trouble loosening it and it will end up falling apart—and falling through the grill grates. This is particularly true of fillets. If you choose fillets, be very gentle and keep the surface oiled to avoid sticking. A grilling basket or fish basket can make the job a lot easier. Steaks that have been cut across the grain of the meat hold together better, so if you are concerned about the fish sticking to the grill make sure to choose halibut steaks. If you choose to marinate your halibut before grilling, you should use a mild marinade and keep the marinating time to a minimum. Strongly acidic marinades can break down the meat causing it to fall apart when cooking and making it difficult to grill. Dry rubs and bastes work very well with halibut, but because of the fish's mild taste, you don't need much flavor enhancement. Because this fish will dry out easily, the grilling time on halibut is pretty short. So make sure to keep a close eye on it to avoid overcooking. A 1-inch halibut steak will grill up in about 10 minutes over medium-high heat while thinner cuts and fillets can cook in as little time as 6 minutes. Turn just once during cooking to avoid having the halibut fall apart, and keep the heat at medium-high (watch for burning). Halibut is ready to eat when the meat is opaque through the middle. If you look at the raw fish, you will notice that it has a glossy sheen and a translucent appearance. Once this characteristic is completely gone and the flesh is nontransparent and drier looking, the fish is ready. You can also tell it is ready when the meat flakes easily with a fork. Whether it's a fillet or a steak, you should be able to pull the meat apart all the way through when you serve it. (Keep a fork or similarly pointed tool handy while grilling so you can test for doneness.) A final way to test for doneness is checking the internal temperature; a meat thermometer should read 145 F/63 C when the halibut is ready to come off of the grill. Properly cooked and seasoned, halibut is one of the most versatile—and healthiest—foods you can cook. Grilled halibut is great in kebabs, tacos, salads, sandwiches, and of course by itself. Grilled halibut over a bed of vegetables or topped with a fresh caper salsa is a delicious dinner that will elevate your summer barbecue to the next level. You also can try substituting it in your favorite recipes that might call for other fish or even chicken. If you can't find halibut or are looking for a similar fish, try striped bass or cod (for steaks), and flounder or fluke for fillets.